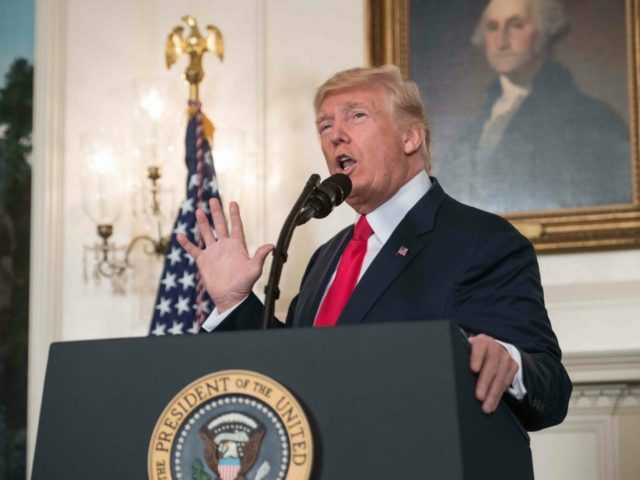 President Donald Trump responded to two days’ worth of criticism on Monday by criticizing the white supremacist groups involved in the Charlottesville violence on Saturday explicitly in a statement from the White House. But Trump’s condemnation did not satisfy the mainstream media, some of whom rushed to criticize Trump for not delivering that explicit condemnation as quickly or as passionately as they believe he ought to have done. CNN’s Jim Acosta, who was present, shouted a question at the president after he finished his statement: “Do you regret not mentioning the white supremacists on Saturday?” He later took to Twitter to complain that Trump had not answered questions. Trump did not take questions. He was asked by reporters why he waited so long to condemn hate groups. He did not respond.
.@realDonaldTrump “hatred, bigotry and violence..” he names them under pressure. There were many other examples. Toronto Star correspondent Daniel Dale complained that Trump was not as effusive in describing Charlottesville victim Heather Heyer as he has been in mourning Kate Steinle, who was killed by an illegal alien. Striking how vivid Trump has been in describing, say, Kate Steinle, in contrast to the complete absence of detail about Heather Heyer. Was Trump's statement too little, too late? He began by bragging about accomplishments, then briefly dealt w/talk about racism. Throughout the 2016 campaign, the idea that Trump failed to denounce extremist groups was a repeated theme among media critics and political opponents. In February 2016, for example, CNN’s Jake Tapper challenged Trump to denounce KKK leader David Duke, even though he had already done so publicly on more than on occasion.